New Year’s Eve was quiet in our house. Skipper sent himself to bed at 8:00, Little Ironman and Dave followed shortly after and I stayed up (far too late finishing The Hunger Games). It’s not that we are boring people; it’s just that we planned to be up this morning to head to Brantford, Ontario for the inaugural Mayor’s Resolution Run. Dave has been working with the race director, Bill Jol, for the past several months helping him organize this 5K and 10K event. When I realized that Dave was driving 60K to volunteer at a race, it only made sense for me to run one of the races. And, of course, the boys came along with us: Skipper was set to help at a water station and Little Ironman was happy to just tag along. However, I had two reservations about running this race. First, Dave wanted to be in Brantford early but I was concerned that I’d end up waiting in the cold, which could result in with a pulled muscle; once we learned that The Armoury would be open for runners at 7:30, it was easy to decide to go with him. My next dilemna was deciding which distance to run. While I had a few strong races in the fall, I still didn’t have my race legs back. After last week’s disaster in Hamilton, I knew that I needed a race where I could push myself and run well. I also wanted to leave enough gas in the tank for a long run the next day, which would be more difficult after racing a 10K. So, I decided on the 5K. Once we arrived at the race site, Dave and Skipper went to work at setting up the finish line, and LI and I went into the Armoury to pick up my race kit and keep warm. All runners got a black technical jacket with their race kits, which also had deodorant, aspirin, shower gel and the usual race fuel and literature. It was one of the best kits that I’ve received in a long time. At 8:30, all three boys left for the water station that they were “manning” and I headed out to warm up. The plan was for me to race the 5K, run to the 7.5K water station as my cool down, and drive back to the finish line with them. With all boys out of sight and mind, I was able to warm up properly and I was mentally ready at the start line. When the horn sounded, all 5K and 10K runners started together and we stayed together for the first 4.5K. I found this a bit frustrating because I didn’t know whether I was chasing 5K or 10Kers so I just ran fast. But not too fast. Today, I ran with my head. My first kilometre was fast but comfortable (clocked at 4:17 but I’m sure the kilometre marker was off) and by the end of the second kilometre, I passed all but three women. I knew one was Krista Duchene, who was running the 10K in hopes of a spot at the Olympic trials in Vancouver, but I had no idea who the others were. So I just continued with my strategy: run fast. By the time the finish line was in sight, I saw that I was heading for a sub-22 minute time. I was hoping to be closer to 21 minutes but I was determined not to cross 22; I pushed hard and finished in 21:58. Phew! Better than that, though, was I placed as the second gal and first Master, which meant a medal and a nice little cheque to bring home. The entire time, I didn’t notice my pace picking up or slowing down so I think I’m getting a better sense of racing shorter distance again. I had lots left to push for the last kilometre so I can probably give more next time – perhaps, hurt a little too. Today’s race reminded me that I can run hard and pace myself, but it also gently told me that I have some work to do to get back down to a 4:12 kilometre pace. As planned, I ran out to the last water station to meet the boys who were, by then, finishing up with the last runners. The clouds had come in, it was starting to rain and I was happy to be able to go back for the awards. By the time we returned to the Armoury, we didn’t have to wait long for the awards to begin. 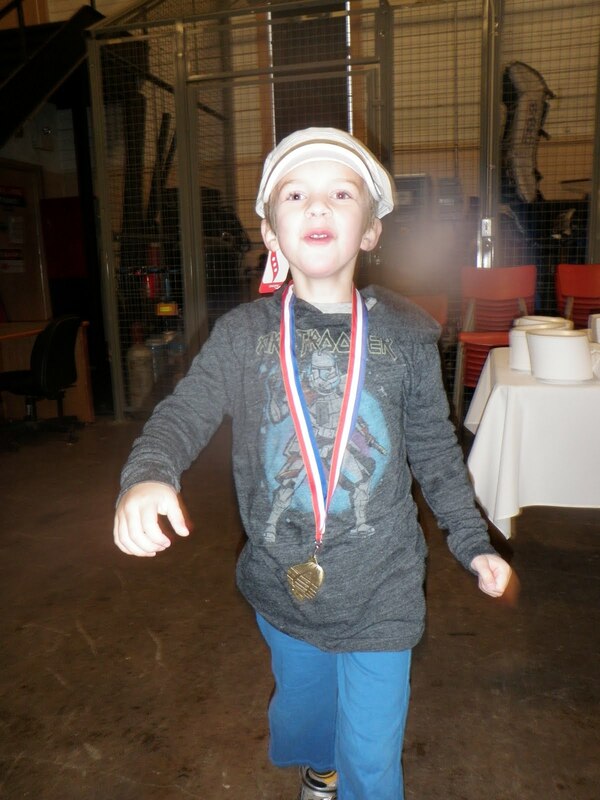 Skipper was delighted to wear my medal and new Saucony running cap. 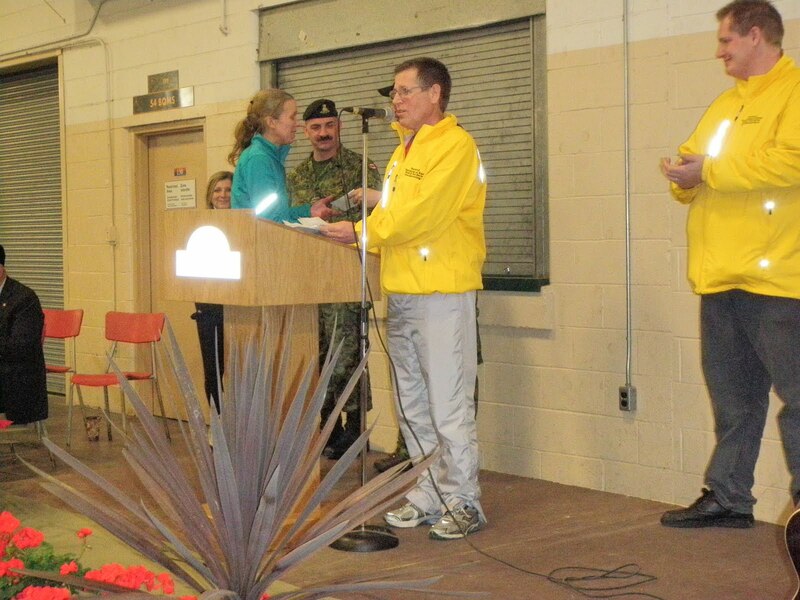 What was unusual about the awards was the overall and first Masters runners were asked to wait another hour to receive our cheques from the Mayor of Brantford. I was happy to. After all, the boys were busy and happy, and it gave me a chance to get to know Krista Duchene (who did qualify for the Olympic trial with 1 second to spare!) and another Master runner, Kevin, whom I had seen at a few other races I’ve run. I left Brantford feeling much more together than I did after last week’s Ten-Miler. I had a good race – not my best 5K, but a strong one. It was just what I needed to get my confidence up a bit. And with the warm-up and cool-down, I ended up with the highest weekly mileage in exactly a month – also good for the confidence. Most importantly, though, today’s run made me realize that I can do it. But it also helped me understand that I’m ready to push myself again, that I want to push myself and I’ve definitely have some work to do over the next few months if I want to closer to 20 minutes in the spring. But I can do it. Today was the first day towards making that happen. Congrats on the great race – I used to live in that neighbourhood, so it is nice to hear of a great new race popping up. Glad your kids had so much fun too! Previous Previous post: Who’s Boss Now?